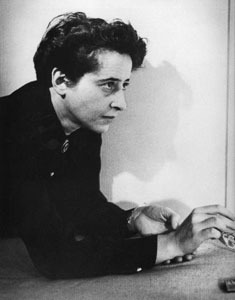 The work of the German-American political theorist Hannah Arendt is widely acknowledged in contemporary social and political debates, yet her unique understanding of the inter-relationship between cultural practice and the polis has been largely overlooked. “The Crisis in Culture: Its Social and Its Political Significance” published in 1961, was Arendt’s contribution to the debates of her time concerning avant-garde and kitsch, high and low culture. This fiftieth anniversary serves as an occasion to take up this text, explicate and elaborate upon it, bringing Arendt’s ideas into dialogue with the questions faced in contemporary thinking on art and politics. Following a seminar in London and a reading group in Berlin, GOLEB is pleased to host a series of reading sessions and presentations as the Amsterdam component of this commemorative project, organized by Jeremiah Day. On September 20th, artist-researcher Jeremiah Day will introduce his project on Hannah Arendt to the public. The presentation will be followed by a screening of two documentary films on Dischord Records: Jem Cohen’s Instrument (1999) and Max Le Cain’s and Tim Furey’s (PR) Evens (2006). Following Arendt’s focus on the distinction between culture and entertainment, we will consider the way Dischord Records’ founder Ian Mackaye has tried to organize a practice in which music is not reduced to consumption, and as an example of the engagement of art with public life. On September 24th, Jeremiah Day will lead the first of several reading sessions focusing on Arendt’s The Crisis in Culture. The session is open to everyone and requires no preparation, as it consists of a collective, ad hoc, reading of the text and the discussion that ensues from it. Forthcoming reading sessions will be held October 15th and November 5th.